First "Green When Ripe" - love it!!! "Grub's Mystery Green", 58 days from transplant - first ripe fruit I've taken today. Very compact indeterminate/semi-determinate. Growing in 18 gal. container. This is my first time ever growing, seeing or tasting "Green When Ripe" variety... All I can say is WOW, absolutely love it! Sweet, fruity, beautiful - to me, looks almost like an apple, full of flavor with just the right amount of acidic taste! Nice D_V I have never tried a GWR tomato. I suppose there is a slight learning curve trying to figure out when they are done. You are right it looks just like a good apple. Light feel at the blossom end - seem to be softer than before, and chartreuse color - worked for this one, got lucky, but now I know! Wow, looking at the photo, you wouldn't know it would be ripe at all. I'm growing GMG for the first time this year and am interested to see if any of the earthy flavor from Paul Robeson is present (if it is in fact related). Moldovan Green was pretty early for me last year. It is very good, and similar to Evergreen. The first five I listed are all similar in flavor, probably resembling the sweetness of GMG. 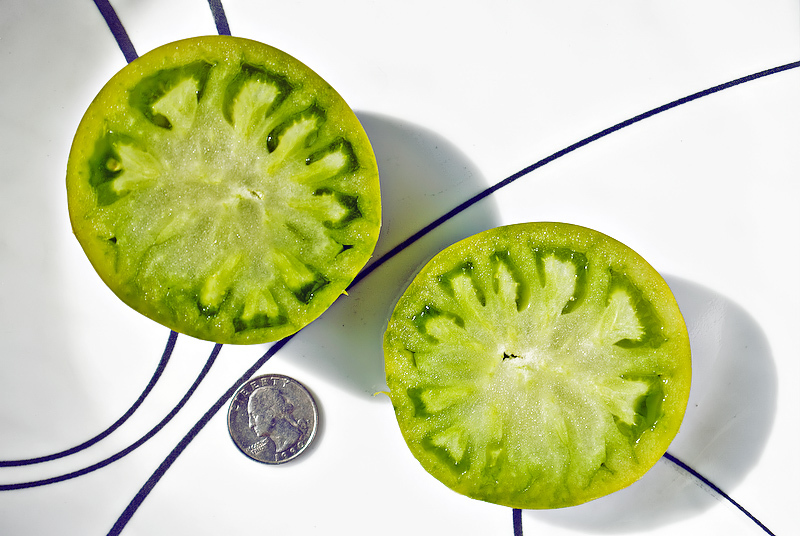 Green Giant and Cherokee Green have larger fruit and are often picked as the top tasting greens. LGS and GS and GZ are quite different in regards to flavor from the others and each other. They are flavorful and many people like them, but personal preferences differ. GS is a dry paste type so would be good for salsa/pico de gallo. It also has a funny prostrate bird's nest growth habit that is more suited for a hanging basket than trying to keep it upright. Inlike the others, Green Giant has clear skin, like pink beefsteaks vs red, so is a bit more difficult to ripe-pick than the amber skinned greens. You may not want to make sauce from them because the green turns an unappatizing muddy army olive drab when cooked. 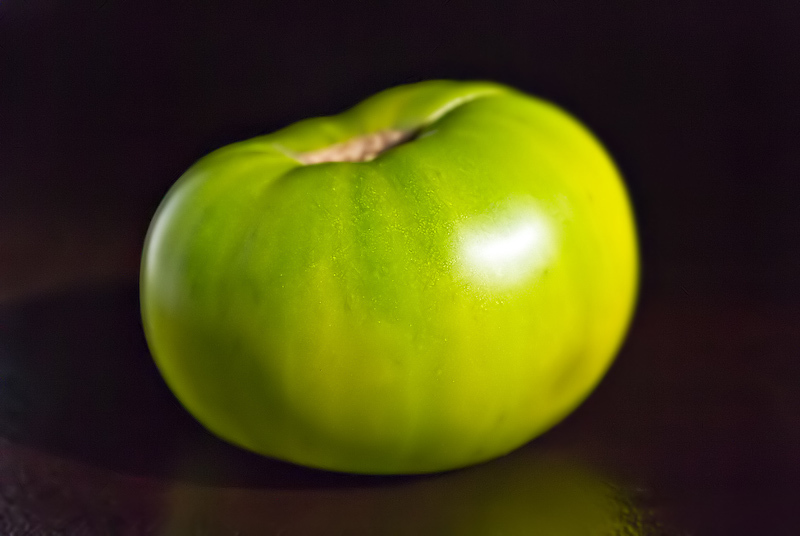 I've never had a GWR tomato, either, but would like to give one a try (trying a "black" variety this year. 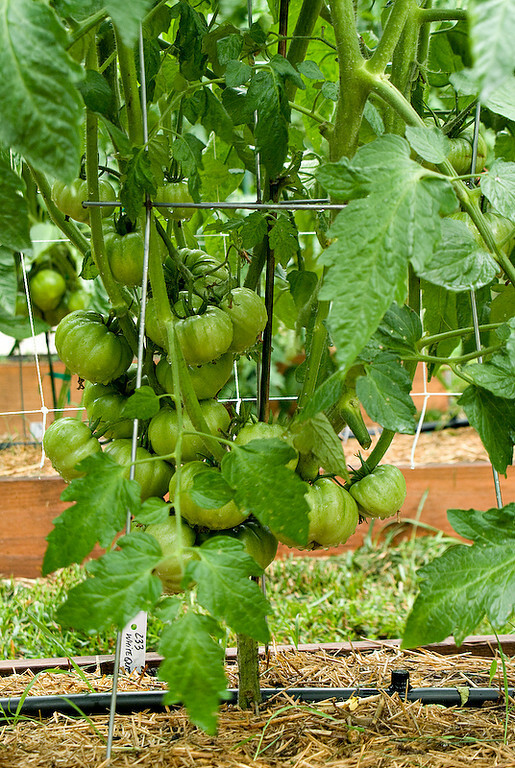 I also want to try a white when ripe tomato, anyone ever try one of those? Thanks for the feedback, TZ, appreciate it! Glad to hear you were pleased with MG, Tatiana said those were among her favorites, so I indeed look forward to trying those. Ananas Noire - is on my 2011 list as well, just under "bicolors" - amazing pallet of colors inside, had to put them on the list to try. Garden5 - I haven't, since most people refer to "White" tomatoes as bland... After reading Carolyn Male's book, one of her 100 heirlooms was White Queen. "...It is also the best-tasting variety of it's colors, being fruity and sweet, and not bland like most ll the other white tomatoes..."
Hey TZ, what was the typical fruit size that you saw on the Green Zebra when they were ripe? I have a lot of Green Zebras on the vine. They are beautiful with the 2-color striping; but the tomatoes are still somewhat small, and feel very firm ... so, I am assuming that they are not nearly ripe at this time. This is the first year that I have grown the Green Zebras; so, I'm looking for some pointers. Green Grape, Absinthe and Aunt Ruby's German Green. lj... thanks for the info and the picture; that helps. I will look for the color change on the shoulders, and will keep giving the Green Zebras a "light squeeze" to see when they soften a bit. Green Zebra is in between golfball and tennisball size...maybe around 2.0-2.5inch diam. It takes two bites to eat one if I recall, or dainty quarters in a salad. It has two different flavors depending on when you eat it, early ripe or late ripe. If you don't like one flavor be sure to try the other. The amount of amber coloration will let you tell. When you have ripe "yellow" ones on the plant you can work backwards. The biggest tomato I have grown was Great White with 2 lb fruit common on the plant. It along with White Beauty, which I grew last year, are supposed to be among the most flavorful whites. They have flavor enough that you can't complain but it is not as intense as most colored tomatoes so they are often left behind when people have a choice sitting on the counter. The white color is just a version of yellow, and Limmony is nearly white when it starts to ripen. The flesh stays white while the skin turns yellow when fully ripe. It has a strong tangy flavor like Sweet-Tarts candy, a little stronger when early ripe than late ripe. Because of the flesh color you can mix it with white tomatoes to make an excellent sauce that has a bit of a citrus twist to it. It probably does the same to red sauce as well, but my discovery was based on one pot of white sauce I made, and put off eating for nearly a year, past planting time last year. Duh_Vinci wrote: Thanks for the feedback, TZ, appreciate it! WOW, looks like your going to have a lot of tomatoes! Is that all on one vine? Why are my tomatoes Ripe outside, but green inside? 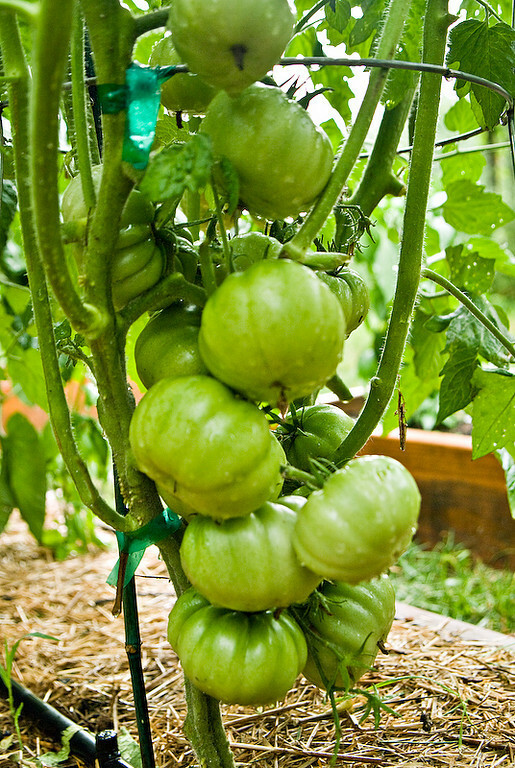 When are green tomatoes "ripe"?